There are many reasons why one would want to leave consulting. And although there are many perks of life outside of consulting, and many other career paths to follow. 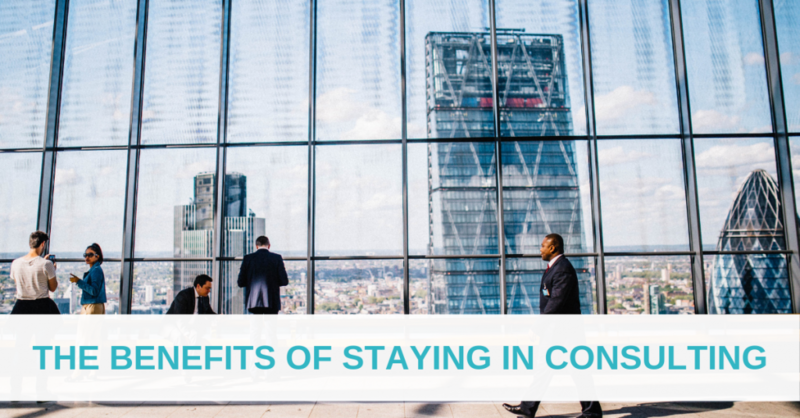 There are also benefits from staying, which we will highlight below. Consulting skills are extremely transferable. You work with some of the most capable people in the business. The skills you develop are highly sought-after in the job market. These are one of the most attractive aspects of following a career in consultancy. In consulting, there are also many benefits in learning professional management skills and technical skills in a quick turnover period. Being able to see a lot of different corporate operating environments before going straight into what you want to do is a huge perk. The additional reference points are great perspectives to know what good/bad look can look like. Consulting can also train people well from a comms and upwards / downwards / self-management perspective that sometimes the lack of structure in tech may not provide to the same degree. Many have had a great experience transitioning from consulting to tech. If you choose to stay in consulting, you also learn tangible business semi-basics (valuation, strategy, financial modelling…) – which is highly relevant in the UK where newly graduated candidates from all degrees can enter consulting. These transferable skills remain as sought after as they ever were. In general, consulting earnings are £45-270k, depending on seniority and the type of consulting firm. At junior levels, corporates and consultancies pay better than start-ups. However, the opposite is true at senior levels in a popular industry for ex-consultants such as start-ups. This is driven by the value of equity. Up to Manager level, consulting pay exceeds corporate and start-up pay; eclipsed only by private equity. Start-ups and scale-ups, for example, have become very popular destinations for consultants to move to. On movemeon growth stage start-ups receiving 24.59% of applications. Although this is a popular option, start-ups are unable to afford to pay the best salaries to ex-consultants. So the pay advantage of staying in consulting is even starker at junior levels than compared to corporates. At Manager level, for instance, pay in start-ups lags consulting by 20%. Despite the rise in huge tech brands, consulting still remains a fast-track. And certain brands in particular (in a similar fashion to the university/school you attended) are a rubber stamp of calibre. After many years in consulting, you are sought after for opportunities that wouldn’t be thought suitable for those with only a few years of experience elsewhere. Former management consultants can potentially make great CEOs and senior leaders. If you choose to stay in consulting, you are in a good position to start planning your next move well in advance. Most reputable headhunters are always happy to speak to good candidates even if it’s just to establish a connection or to learn about the market. Look for people who have been working in the sector for a long time and understand the landscape well.